He writes in his autobiography "Mor Jiban Sowaran" (মোৰ জীৱন সোঁৱৰণ), that he was born in a autumn night, it was Laxmi puja( fool moon). Lakshminath Bezbarua was born on a boat, as it stood moored in a sand bank of the river Brahmaputra at Ahatguri, near Nagaon on a Lakshmi Purnima night, in November 1868. His father Dinanath Bezbarua, a senior official with the British government, was in the process of moving to Barpeta due to official transfer. Lakshminath Bezburua spent his childhood in different places of the Assam. His father brought his family with him from Barpeta to Tezpur. From Tezpur they shifted to North Lakhimpur. In between the family stayed for a brief while at Garchati and finally they settled in Sibsagar. Lakshminath Bezburua statrted his early in education Sibsagar Govt. High School at Sibsagar. Then, he graduated from the City College in Calcutta. Thereafter, he took his M.A. and B.L. degrees from the Calcutta University. Lakshminath Bezburua married Pragyasundari Devi, a niece of the poet Rabindranath Tagore. Laxminath Bezbarua is called as a" Rasaraj"( which means, king of humor), because he was a great humorer, he wrote his Humor writing as a "Kripabari Barua", with this pseudo name he expressed his griefs for the Assamese society with a funny stories. 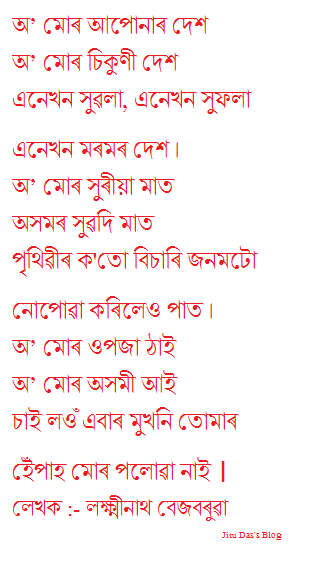 Because of his great talent to touch every field of literature with such beauty.He wrote, poems, short-stories, stories, novels,humor,translation of folk tales, such a great way, that, only a few could.Atulchandra Hazarika is also a great translator. 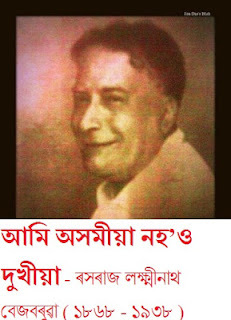 Laxminth Bezbarua was a great writer, because he started a revolution of Assamese Language. 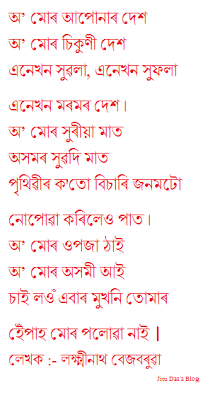 He was a optimist.Thats why wrote, We are Assamese, we won't be poor.He was passionate writer, and a honest one too. in your life, you won't find it. My longing has not end.